Last week I paid a visit to a couple of friends. They recently gave birth to a beautiful daughter and, with the help of some friends, I organized a small surprise party to welcome the newborn. During the evening, the newbie father told me, with a touch of bitterness, that any of his present project team members had organized something like that, nor congratulated with him for the birth nor even asked news about the baby. My friend was clearly upset by his colleagues’ behavior. He felt he didn’t deserve this attitude after months of close collaboration and blamed his team members for that. They simply had not been fair in his regards, since that particular team was used to organize recreational activities for occasions like this one. While I was going back home, I kept thinking about what my friend told me, and I felt a little sad about that. I do not know anyone of his colleagues personally, and I assume (yes I know...assumptions are tricky...) that he was right to be disappointed. After a little, I realized that I was watching just one side of the coin, and I tried to change the perspective. Following this line of thought, I started to consider the extent in which we can actually influence outcomes and the extent in which outcomes are instead influenced by the environment we operate in. Suddenly I started to think about the reason why some people are more prone to blame or praise others for their success or failure while other people tend to blame mainly themselves. Where is the balance? Are these behaviors always positive or negative? The Locus of Control describes the vision we have on our capability to influence outcomes. External Locus of Control An individual that has an outside Locus of Control believes that every event in his/her life derives from factors outside his/her control. These factors can be summarized mainly as other people actions, luck, destiny… This kind of individuals tend to blame or to praise other people or circumstances for whatever success or failure they experiment in life. Internal Locus of Control An individual that has an inside Locus of Control believes that every event in his/her life derives from factors under his/her control. This kind of individuals tend to blame or to praise themselves for whatever success or failure they experiment in life. In Figure 1, we can see an image that depicts a possible interpretation of the Locus of Control applied to project management. On the x-axis, there is the position of the Locus of Control for a given project manager. On the y-axis, there is a measure of the success or failure of a given project. 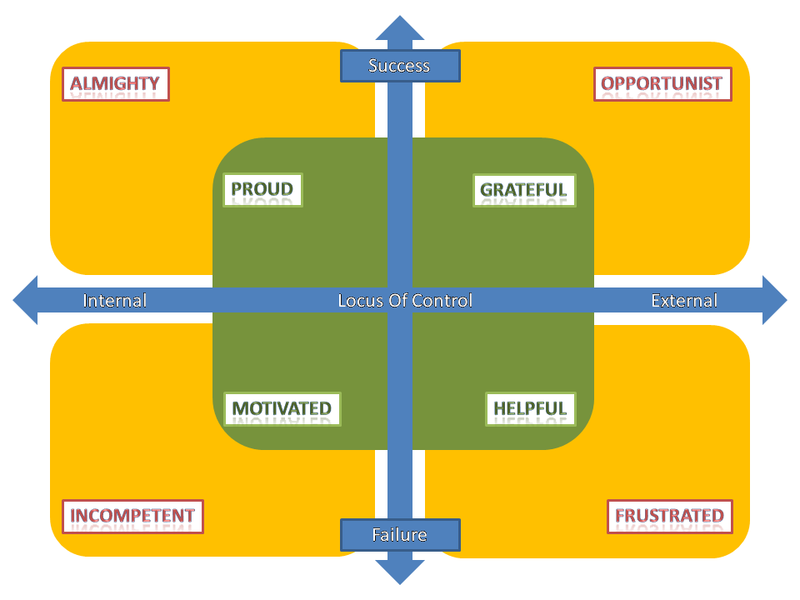 The four quadrants represent how the project manager will explain success or failure as a function of his/her Locus of Control position. Figure 1. Interpretation of the Locus of Control applied to project management. Almighty - Strongly internal Locus of Control and success - I have everything under my control. I am solely responsible for the outcome of all project’s activities and accountable for the outcome of the project as a whole. I can manage any project respecting any given constraint. The project team is pretty much irrelevant. Incompetent - Strongly internal Locus of Control and failure - I have everything under my control. I am solely responsible for the outcome of all project’s activities and accountable for the outcome of the project as a whole. I am obviously a poor excuse for a project manager. I can virtually doom any project that I put my hands on. Opportunist - Strongly external Locus of Control and success - There is nothing I can control. I cannot be liable for the outcome of any project’s activity and for the outcome of the project as a whole. I take credits that I do not deserve. Other people should be praised for this. Frustrated - Strongly external Locus of Control and failure - There is nothing I can control. I cannot be liable for the outcome of any project’s activity and the outcome of the project as a whole and yet I am wrongly accountable for success or failure. If the Locus of Control is on the near left or near right side of the graph in Figure 1, the project manager will tend to interpret success and failure in a proper way. He/She will build a balanced perception of himself and he will experience feelings that could aid the execution of a project and team management activities. Furthermore, since feelings in this part of the graph are far less extreme than those experienced in the extremities, they are not mutually exclusive. Chances are that the project manager could experience a full range of feelings and could consider himself as a balanced set of the four categories below. Project execution will be largely and positively affected. Proud - Internal Locus of Control and success - I have many things under my control. I am partially responsible for the outcome of all project’s activities and accountable for the outcome of the project as a whole. I can manage projects respecting and balancing reasonable constraints. The project team is fundamental. Motivated - Internal Locus of Control and failure - I have many things under my control. I am partially responsible for the outcome of all project’s activities and accountable for the outcome of the project as a whole. I am not infallible. There is room for improvement, and I want to allocate time to professional development. Grateful - External Locus of Control and success - I have not many things under my control. I cannot affect the outcome of all project’s activities, but I am accountable for the outcome of the project as a whole. Other people in the team greatly contribute to the project’s success, and I have to praise them for their efforts. Helpful- External Locus of Control and failure - I have not many things under my control. I cannot affect the outcome of all project’s activities but I am accountable for the outcome of the project as a whole. Other people in the team can contribute to the project’s failure, and I have to help them to realize their true potential. I have to contribute to their professional development in as many ways as I can. Where is our Locus of Control? I do not know if it is possible to measure the exact position of our Locus of Control and I am not sure that we can change it in some way. What I am certain about is that a too extreme position of the Locus of Control can severely impact the ability of a project manager to effectively and efficiently manage projects and teams. So I believe that is of the greatest importance that every project manager try to estimate his/her Locus of Control position each time he/she is bound to evaluate project’s performance, to avoid polarization in his/her judgement. Every time I have to evaluate my performances regarding success or failure of some activity, I always try to localize my Locus of Control, asking myself “Are you sure to be absolutely not polarized? Are you objectively evaluating the chances you got to influence this outcome? Have you done everything that you could have done?”. Feedbacks from our peers and our project management team can be of the greatest help in this kind of activity. As a matter of fact, the localization of the Locus of Control is a very difficult activity, since this is something that is at the very core of our way to perceive reality. In the next post, we will examine another hidden trap, related to the Locus of Control that could threaten proper management of projects.